Poole Hospital NHS Foundation Trust is happy to support the use of the Dorset Carers Card scheme. As of June 2017, the hospital’s Dolphin Restaurant has joined the Dorset Carers Card Scheme, as a way of acknowledging and thanking carers for the valuable work that they do. Carers make a huge contribution to Poole hospital, not only in providing invaluable information (by being the experts in the person they care for,) but also supporting with the care needs of their loved one, aiding the discharge plans and often reducing the need for admission in the first place. We need to value and support them and this discount is just one of the ways in which we do so. Find out more about what support Poole Hospital NHS Foundation Trust can offer carers via the Carers support service intranet page. Brenda is a family carer who currently cares for her husband; who has been in Poole hospital for just over 6 months. Brenda (alongside other close family) support him with his care needs while he has been an inpatient here. This support encourages a better working partnership between staff, carers and patients. It supports continuity of care for the patients and the better communication with the people who know the patients best, their carers and family. Prior to being referred to the carers support service at Poole Hospital NHS Foundation Trust, Brenda was unaware of where to find information and support for informal carers in Dorset, even though she had been the main carer for both of her parents previously. Her advice to other people, who may be supporting a loved one, is to recognise it! If the person you care for would not cope without you, you may be able to get support. Most people don’t see themselves as carers, however being aware of your role as a carer, sooner rather than later, is important; knowing what support may be available, before you need it, can be very reassuring. Brenda also felt that when thinking about hospitals, it’s important for carers make the staff aware of the sort of support they give. Poole Hospital NHS Foundation Trust aims to ensure the involvement of the people who know the patients best. There is no duty for carers to be actively involved with inpatient care, however if they wish to assist with care, then it should be welcomed. Brenda said that the support and recognition for her role as an expert was great, she has felt valued and supported by Poole Hospital NHS Foundation Trust. Additionally, the discount has helped Brenda, as meals are one less thing to worry about; this has therefore meant that she has been able to continue with her husband’s care. Caring can have a significant impact on health, with reports carers often skip meals, as 45% of carers stated that they have found it hard to maintain a balanced diet, (from the Carers UK report The State of Caring 2017), Kevin Bailey and the restaurant team are proud to be able to support carers in this way. 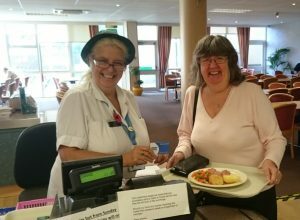 Below image – Liz and Brenda when she uses her Dorset Carers Card at the Dolphin Restaurant at Poole Hospital NHS foundation trust offers staff discount.